Key phrase is they live in *public housing*. Aka, not private privately owned property. So they really aren’t getting away with anything. They just live in the projects. This happens in India at a much worse level. My doctor uncle who rented his bungalow for 2 years, ended up letting the guy stay for more than 12 years. He could not evict him till date, in spite of going to court. Now the tenant pays a paltry rent (agreed 12 years ago) in court every month. My uncle could not sell it and raise the rent. My boss at work story is worse, the tenant refused to move out and he ended up paying 2 years worth rent back to the tenant so he will leave. This was settled outside court before a local political leader who took a commission from both parties to settle the issue. Rent control act in India only favors tenants and any rental agreement is pretty much useless as your tenant almost always finds loop holes / bribes judges in court. US is way better in that regard. How long was the tenant going without paying your uncle at all? This is true, even more so with commercial properties in India. However, most of the rent rules there nowadays are more equally written in that they do allow evictions and orders sooner. Problem is every person who gets a court order against them appeals to the state high court either way. Canada is just as bad, Tenant is taken at their word, whereas Landlord is usually not believed unless there's a stack of documents proving their case. My ranking of top 4 jurisdictions that are bad for landlords in the US and Canada are NYC, San Francisco, Chicago (their deposit rules), and Ontario (evictions take 3-4 months on average if not longer, and usually 2 months just to get a hearing). Yes, that's three cities and one entire province. What specific reasons are each of the 4 jurisdictions you mentioned bad? For example what are the deposit rules in Chicago. Many reading this would benefit from some specific examples. I dunno. After that they also said that the "owe" 34,000 Euro & that I should be glad they weren't my tenants. If the landlord is getting paid nobody cares if it's from the tenant or Section 8 or something of that nature. I dunno that it's really all that important to try to dissect exactly what this dead beat said & or means. The general consensus is that this person is a leach & feels no shame admitting that as adults they are unable or unwilling to take care of their responsibilities & feel no guilt passing those responsibilities onto others. That's what we need to be focusing on. Find the correct immigration officials in Italy and send them this person's information if you have it. If this is credible, Italian officials will take note of this bad character of someone who may be in their country on a renewable or non-permanent visa of some sort. ALSO, just for others reading this... NO, the EU is not a place to go for Americans who want to take advantage of the system. My experience with other EU countries (though not Italy specifically) is that unscrupulous tenants can take advantage of landlords for years of court battles, but the tenant's debt to the landlord continues to accrue, while the debt cannot be discharged and is taken seriously by the legal system. Chicago there have been posts here about deposit rules, including penalties (plus legal costs) against landlords for not using them to the letter. There was a post a few months ago (I think on this forum) about a lawyer who represented a landlord that bought a property, and the $1,000-2,000 deposit wasn't applied properly. Tenant took landlord to court, won, and landlord had to pay $15k in legal costs (of course lawyers love it), plus the deposit. That's why most landlords in Chicago prefer just not taking a deposit. SF has extreme rent controls regarding evictions and increases, again the specifics I'm not 100% on, but on most older places (and I think newer) essentially once a tenant is in it's hard to get them out (and also to increase rent). NY, same issue, that's why there's million dollar properties that you can barely increase the rent, as well as tenants not moving in years. I've seen a few million dollar properties with tenants paying a few hundred in rent. Ontario, the rules depend on which political party is in power. It use to be that units built after 1991 were exempt from rent control rules in terms of amount, with guideline being "the lower of 2.5% or CPI increase". The previous government, just before the election, changed that to eliminate exempt units, putting everything under rent control. New government comes in, changes it again and now everything built after November of 2018 is exempt from increase amounts. The current rent increase guideline, as an example, is 1.8%. San Francisco's rent control rules, for example, from March 1 2018 to Feb 28 2019 allow a landlord to increase the rent on controlled units by 2.6%. Oh and as I said, anything a tenant says for the most part is taken at face value. In Ontario if a tenant files a form and there's an error, the tenant is allowed to amend it at hearing. Landlord files form and there's even a slight error, landlord has to re-file and hearing dismissed. I read a case where the landlord made an error on a notice by rounding 2 cents, application denied. Tax rules are a different issue. You can be primarily involved in managing your rentals in the US and the IRS will consider it active income. In Canada, you can have a 100 unit building, and that can be your main source of revenue and main thing you spend your time on, but if you don't have "more than 5" (at least 6) full time employees, then it's considered passive income. I think what we should focus on is the "facts" presented by this person who doesn't give a name. Public housing means...PUBLIC HOUSING. They might pay PART of their rent, but the government pays the rest or owns the property. At about $200 a month, (using your numbers) I guarantee you the landlord is getting some money for the property, or the government is the owner and for whatever reason isn't pursing the tenant portion. Secondly, you can't just move to the EU and get free health care, even if you are disabled. There are a lot of hoops to get through, and in the meantime you are paying your own healthcare costs. I'm an American currently living in the EU. You are almost certainly being trolled. Exactly. I think it’s bogus. 1- Don't believe everything you read on internet. 2- A lot of people call it socialism etc.. Italy is not a socialist country just have better social proprams then US. Almost all of Europe has better social programs then America, they are fine with it. They have their own goods and bads, America has its own. Just because you don't know something doesn't make it bad. 3- According to post, they are disabled, and one has cancer. I don't want them to do Kemo in the morning and go to work afternoon. which I had a coworker, had a similar situation and she had to come to work which is ****** to me. If Italy taken care of them it is good for them, what is all this hate about. Studied abroad in Italy and LOVED the beautiful environment, great food (you haven't had Italian food until you eat it over there), and hospitable people. With that said, Italy has a different approach when it comes to the rights of business owners and corporations and employers, vs. the average person. That's their right to do as they please, and we can debate if it makes sense or not, but we need to focus on the real issues for landlords here at home. We have some politicians here who want to make evictions much harder, and force private landlords to face greater risks . I say this as a member of neither party, and someone who has "liberal" and "conservative" views, depending on the issue (I am strongly against getting too much into politics on BP and other productive public forums, so will leave it at that). While everyone should meet basic standard of habitability and follow the laws (slumlords are not a myth sadly, neither are horrible tenants), beyond that, it is important that property owners, large and small, organize and lobby local, state and national legislators. Here in CA, one of the most liberal states in the nation, Proposition 10 (allowing local cities to impose new rent control laws) was rejected soundly by voters at the ballot box, even though Democrats gained more dominance here than they've ever had before. This means lots of folks voted for left-leaning candidates, and against allowing more rent control, at the same time. This was accomplished in no small part due to efforts by landlord organizations (including mom and pop landlords working together). Folks nationally should stay focused on similar issues, and not just leave the big property owners and institutional investors to fight this battle. I was born and raised in Italy and I still have family there. What they are saying sounds bogus to me. It’s not easy to get disability especially if you are not a citizen or a legal resident and you never worked in Italy. Same with health care, you would have to be a legal resident to have access to health care and even then you have to pay for stuff. You can get a almost free visit to a specialist but you would have to wait months for an appointment or you can go to a private doctor and pay out pocket. Laws can be more tenant friendly sometime but for some reason you don’t see too many people getting evicted because people are more responsible with their money. 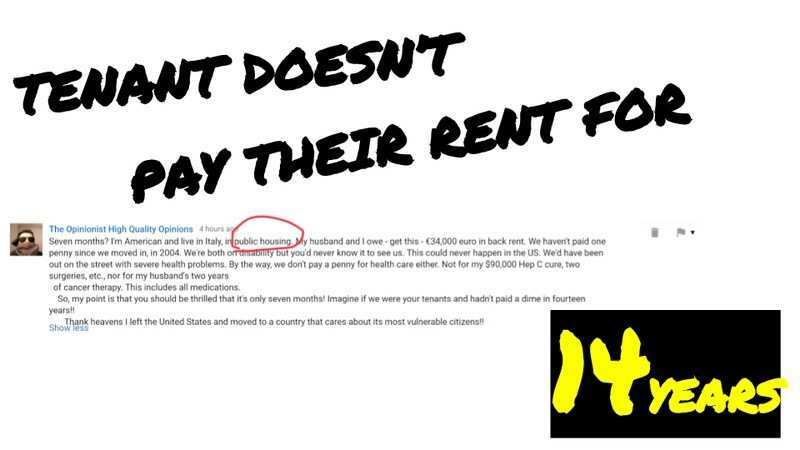 If what they are saying it’s true, it looks like they are living in a public housing and it takes years to get assigned one of those houses and you pay rent based on your income. It usually a small apartment and trust me you don’t want to live in one of those. I was hoping an Italian would come along and set the record straight! Thank you! Get them distracted and fighting among themselves while we consolidate power. @James Wise how is it possible for them to get away with it for 14 years? Awesome. This is some great content Gagan. Thanks for posting all of this info.